ENTER HERE for your chance to win through midnight Easter Sunday 4/5/15. Two of ChiIL Mama's Lucky readers will both win a Pair of Tickets (*a pair of tickets each to two winners--4 tickets total) to your choice of show date/time pending availibility. This year features a piece choreographed by the internationally renowned Bill T. Jones. Northern Illinois University (NIU) proudly presents The Northern Stars of Dance Concert at the Ruth Page Center for the Performing Arts, 1016 N. Dearborn St., April 10 – 12. Showcasing the talent of alumni, students and faculty from the NIU School of Theatre and Dance, the performance will center on Spent Days Out Yonder, a piece choreographed by internationally renowned choreographer Bill T. Jones. Performances take place Friday, April 10 and Saturday, April 11 at 7:30 p.m. and Sunday, April 12 at 2 p.m. Tickets are $20 for general admission and $15 for students and seniors and can be purchased through the Ruth Page Center for the Performing Arts Box Office by calling 312-337-6543. For more information, please visit www.niu.edu/theatre. The Northern Stars of Dance Concert highlights students, alumni, and faculty from the NIU School of Theater and Dance. Founded in 1980, the dance program at NIU has consistently produced stellar dance professionals and features equal training in ballet and modern dance in a conservatory setting. Northern Illinois dance faculty present choreography in a variety of styles, demonstrating the diverse technical skill of the artists involved. The Northern Stars of Dance Concert program includes the masterwork Spent Days Out Yonder, as the centerpiece for the dance concert, set on NIU dancers by Bill T. Jones/Arnie Zane Dance Company member Catherine Cabeen. Spent Days Out Yonder is a pure musical exploration, rare in the Bill T. Jones canon, set to the second movement of Mozart’s String Quartet No. 23 in F Major. The movement is firmly rooted in Jones’s elegant, weighted movement vocabulary, challenging dancers to move with ease, efficiency and physical honesty through the sublime score. The program also includes: Head of the Dance program, Judith Chitwood, performing to the music of Philip Glass in a contemporary ballet duet, Passages, exploring the intricacies involved in staying or leaving in emotional, proximal and physical contexts. Autumn Eckman, a former dancer with Hubbard Street Dance Chicago, Luna Negra Dance Theater, Giordano Dance Chicago, Lucky Plush Productions, RPM Productions and Ron De Jesus Dance, presents Take Five, a premiere choreographed to Dave Brubeck’s iconic song of the same name. Paula Frasz, a 30-year veteran of the Chicago dance scene, will present her signature comic work Silly Love Songs featuring former NIU student Micah Moch (most recently appearing in the film Avatar) as well as her award-winning Sea Songs in which a sailor lost at sea is depicted on the end of a long bungee cord tied horizontally off stage. Newest faculty member Rich Grund restages Paquita, first choreographed for the Paris Opera Ballet in 1846 by Joseph Mazilier, and later adapted by Marius Petipa in 1881. The story centers on a Spanish gypsy named Paquita, who saves the life of Lucien, a French aristocrat. 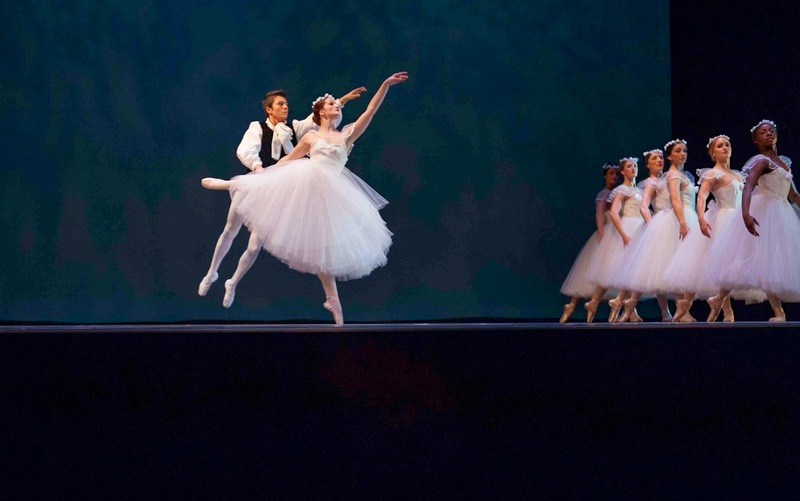 The variations selected for this performance are some of the most celebrated examples of 19th-century classicism and highlight the classical dancing of the Northern Illinois University students. In addition, two alumni perform with their own dance companies: Wade Schaaf and his Chicago Repertory Ballet and Chloe Jensen with Aerial Dance Chicago performing Continuum, an inventive and creative exploration of three dimensional space, momentum, gravity, friction and inertia. Crossing freely between the air-ground continuum, the dancer dives into the air at moments, and dives into the ground at others. Alumni of the NIU dance program have appeared with ABT, The National Ballet of Canada, The Martha Graham Company, Nevada Ballet Theatre, Broadway NY and International tours, Pacific Northwest Ballet, Cirque Du Soleil, Pittsburgh Ballet, Dayton Ballet, Richmond Ballet, Chicago Lyric Opera, David Taylor Dance Theater and more. The School of Theatre and Dance at Northern Illinois University provides intensive artistic and academic training for students preparing for careers in theatre and theatre-related areas. The course of study is rigorous and realistic, designed to develop, challenge, and broaden the skills and attitudes of all theatre students, but especially the highly motivated student who takes responsibility for his or her own growth. The School has an internationally recognized faculty of practicing artists and scholars, and a gifted student body of nearly two hundred, recruited and carefully selected from around the country and abroad. The School offers several degree programs, such as the BA in theatre arts, the BFA in acting, dance performance, and design and technology, as well as the MFA with specializations in acting and design and technology. The School of Theatre and Dance is a proud member of the University/Resident Theatre Association, and its programs are accredited by the National Association of Schools of Theatre. The Northern Stars of Dance Concert, including Bill T. Jones’ Spent Days Out Yonder, was made possible through a grant from the NIU Foundation.